This study examined the use of one online social networking tool, NING™, in teacher education, highlighting preservice teachers’ engagement and perceptions of the tool. Data obtained from 91 preservice teachers suggest that they found the multimodal platform useful as a tool to build pedagogic and content knowledge. Responses to surveys and online forums indicated potential benefits of social networking in higher education with preservice teachers indicating that this tool enabled increased control of their learning. Personalization and capacity to control and contribute multimodal responses were seen as effective in developing a learning community in a diverse cohort of higher education students. Highfield, K. & Papic, M. (2015). Riding the Wave of Social Networking in the Context of Preservice Teacher Education. 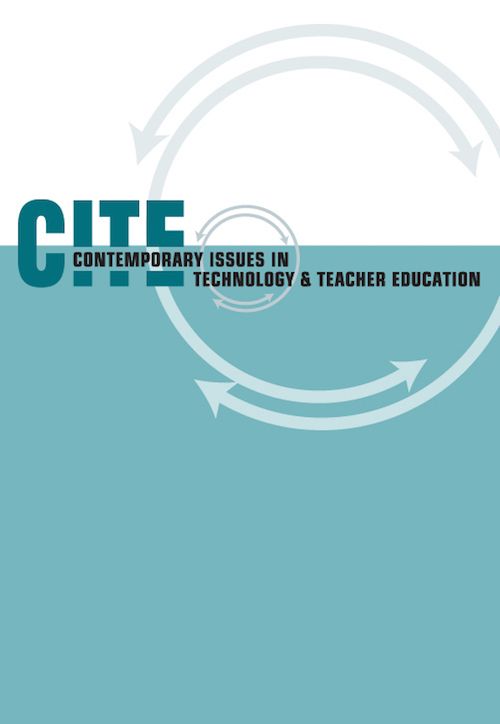 Contemporary Issues in Technology and Teacher Education, 15 (3), 422-436. Waynesville, NC USA: Society for Information Technology & Teacher Education. Retrieved April 19, 2019 from https://www.learntechlib.org/primary/p/149784/. Abbitt, J.T. (2011). Measuring technological pedagogical content knowledge in preservice teacher education: A review of current methods and instruments. Journal of Research Teacher Education, 43(4), 281-300. English, R.M., & Duncan-Howell, J.A. (2008). Facebook© goes to college: Using social networking tools to support students undertaking teaching practicum. Journal of Online Learning and Teaching, 4(4), 596-601. Gavelek, J.R., & Raphael, T.E. (1996). Changing talk about text: New roles for teachers and students. Language Arts, 73(3), 182–192. Herrington, J., Reeves, T.C., & Oliver, R. (2014). Authentic learning environments (pp. 401-412). New York, NY: Springer. Hughes, J., Gonzales-Dholakia, G., Wen, Y., & Yoon, H. (2012). The iron grip of productivity software within teacher education. In D. Polly, C. Mims, & K. Persichitte (Eds. ), Developing technology-rich teacher education programs: Key issues (pp. 170191). Jaipal, K., & Figg, C. (2010). Unpacking the “Total PACKage”: Emergent TPACK characteristics from a study of preservice teachers teaching with technology. Journal of Technology and Teacher Education, 18(3), 415-441. Jimoyiannis, A. (2010). Designing and implementing an integrated technological pedagogical science knowledge framework for science teachers’ professional development. Computers& Education 55(3), 1259-1269. Kay, R. (2006). Evaluating strategies used to incorporate technology into preservice education: A review of the literature. Journal of Research on Technology in Education, 38(4), 383-408. Kimmons, R., & Veletsianos, G. (2014). The fragmented educator 2.0: Social networking sites, acceptable identity fragments, and the identity constellation. Computers& Education, 72, 292-301. Lim, C.P., Chai, C.S., & Churchill, D. (2010). Leading ICT in education practices: A capacity building toolkit for teacher education institutions in the Asia-Pacific. Singapore: Microsoft. Lloyd, M. (2011). A tale of six fish: Achieving social presence through discussion forums in an offline learning environment. Journal of Learning Design, 4(2), 39-51. Lockyer, L., & Patterson, J. (2008). Integrating social networking technologies in education: A case study of a formal learning environment. In P. Diaz, Kinshuk, I. Aedo, & E. Mora (Eds.). IEEE International Conference on Advanced Learning Technologies, Santander, Spain (pp. 529-533). Los Alamitos, CA: IEEE Computer Society. Madson, M., Melchert, T., & Whipp, J. (2004). Assessing student exposure to and use of computer technologies through an examination of course syllabi. Assessment& Evaluation in Higher Education, 29(5), 449-561. Prensky, M. (2006). Don't bother me, Mom—I'm learning! St Paul, MN: Paragon House Publishers. Quong, J., & Snider, S. (2012). To Ning or not to Ning: The benefits of social networking in teacher education programs. In P. Resta (Ed. ),Proceedings of Society for Information Technology& Teacher Education International Conference 2012 (pp. 791-795).